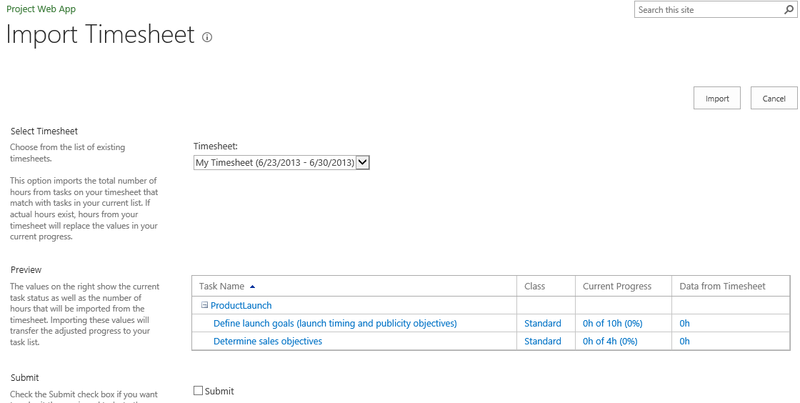 Our last post introduced using Project Web App for progress tracking and covered the Tasks page. 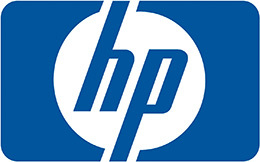 This post will cover the Timesheet page and task time approval. Project Web App includes a separate timesheet function that can be connected to an organization’s accounting system. Many organizations also like to have a timesheet approval process in place. Because this can delaying updates the project manager needs, these functions are now separated. Users can update information on the Tasks or Timesheet pages first and import the data from one location to the other. 1 From the Project Center, select a project by clicking in the empty white box to the far left of the Project Name. 3 Click the Timesheet tab to view all Timesheet ribbon options. 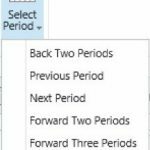 4 From Timesheet:Period click the Select Period icon [ ]. Here, you can select one of the predefined options. 5 Alternatively, click Select Period to view the Select Period dialog box. 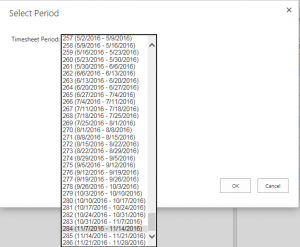 6 In the Select Period dialog box, select a date in the period you want to report. Click OK.
A table of your tasks will appear, similar to the following. Project pre-populates the table with your assignments for the selected period and with administrative tasks that are pre-defined for the organization. 7 Use the options in Timesheet:Tasks:Add Row to select additional tasks not displayed or, if permitted, to specify a new Personal Task. 8 If your organization does not use Single Entry mode for task updates and timesheets, you can import the values from the timesheet to the task updates view. You do this using the Import Task functionality. To do so, select Tasks in the sidebar. Then, from Tasks:Tasks click the Import icon [ ] to see the Import Timesheet page. 9 Use the Timesheet dropdown arrow to select the timesheet period you want to import. Then, preview the current task status as well as the number of hours that will be imported from the timesheet. Next, click the Submit checkbox if you want to submit the previewed tasks to your manager. Finally, add any desired comments, and click Import. Another important function accessed through the Timesheet page is Replace Actual with Planned. This is used when the time to be reported closely matches the planned work. The planned values are duplicated in the Actual Work fields, and the user can edit them to the correct values. 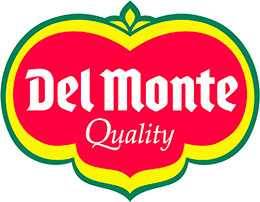 This function is accessed via Options:Tasks:Import. When all Timesheet entries are complete, and you are at the end of the reporting period, click Timesheet:Submit:Send. Then, click the Turn In Final Timesheet option to forward the timesheet to your resource manager. This action closes the timesheet to new entries. Once a team member submits actuals, the project manager reviews the updates, then accepts or rejects them, and updates the project plan. 4 You will notice the Approval Preview page opens in a new window. You can switch between the Approvals window and the Preview window, making changes in the former and refreshing the latter to see the effect of different approval scenarios. 5 Actuals represent reality, so the project manager will generally accept this data. The exception, of course, would be obvious errors, like 40 hours’ work reported on Monday. To accept (or reject) some or all of the updates, use the Accept (or Reject) icons. These are found under Approvals:Actions for the selected entries in the Approval table. 6 You will see a Confirm Approval dialog box, similar to the following. Here, you can enter comments for your team members if you wish. 7 Click OK to confirm the update approval. Task updates are applied to the project through processing on the server. If you have the project checked out in Microsoft Project Professional at the time you are accepting updates, they will not be applied until the project is checked in. You can, however, see the Update Job queue in Project Web App. To get there, go to Server Settings:My Queued Jobs. Once the project is checked in, you will see the updated actuals when you next open Microsoft Project Professional or Project Web App. 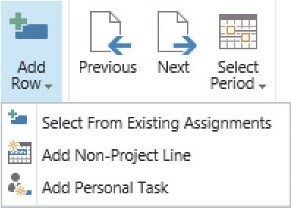 To learn more about the tracking options in Microsoft Project, you can read our more general posts on progress tracking here.